HARRISONBURG, Va. (WHSV) — The Joshua Wilton House is a well-known landmark for people who live in Harrisonburg and for many of those who visit. This year, the home is celebrating a 130-year anniversary.” —Read the full article here. On the heels of founder Joshua Wilton’s 175th birthday on Sunday, along with recent renovations and an accolade from the Wine Spectator, the Joshua Wilton House will host its first wine and cheese tasting on Friday. "One of the things I love about the Shenandoah Valley is all of the beautifully restored bed & breakfasts, inns and manor homes that flourish amid the Blue Ridge Mountains. However, even though I spent my teen years in Harrisonburg, I had never actually been in the Joshua Wilton House until Isabelle's and Collin's wedding..."
Harrisonburg, VA is known for its old districts, and the Joshua Wilton House aspires to remain the center of travel among the old buildings in the downtown area. The inn features fine dining and comfortable stays for anyone to enjoy. Only fresh, local food is served at this restaurant and inn, where top-rated chefs prepare every meal. 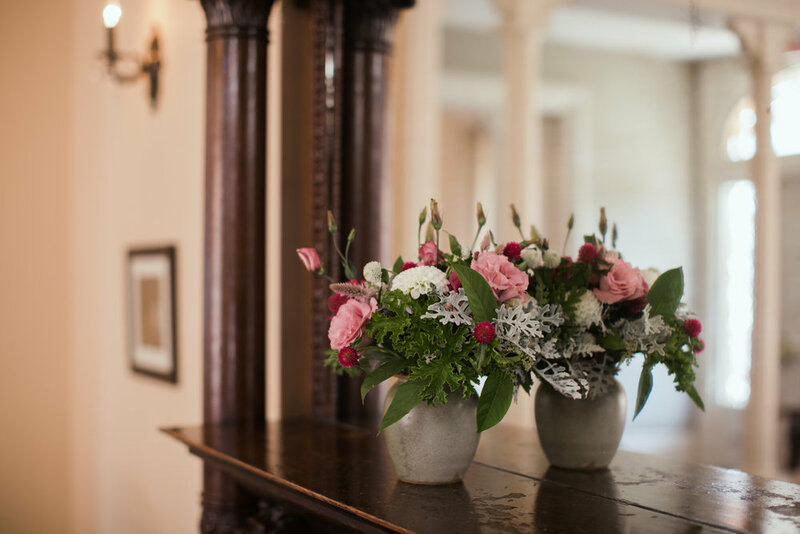 The Joshua Wilton House offers catering, reservation dining, reservation stays at the inn, reservations for parties, graduations, weddings, and other private events. As the seasons change, so does the menu, so going more than once is highly recommended. Date night specials for a special evening out. Located in downtown Harrisonburg in an historic Victorian inn, Joshua Wilton House Restaurant changes their menu daily according to the seasonal fare provided by local purveyors. They offer weekly specials like a Date Night Tuesday ($35 per person for two courses and a shared dessert) and Wilton Wednesday (any appetizer with a beverage option for $14), allowing you to sample some of the finest dining in the city without breaking your bank. "Tom French, 31, was born in Essex, England. He became interested in the culinary world after chefs from a culinary school visited his high school. He received his culinary training from the Colchester Institute. French also worked at his father's restaurant, The Kingfisher Cafe. French crossed the pond to work at the Joshua Wilton House in 2009, where he has served as a sous chef for the last eight years. After his promotion, starting in February, French has been working on switching up the menu and experimenting with different cooking techniques. Along with the release of new menus to change with the seasons, French also plans to create a new chef's tasting menu starting in the fall. French is looking forward to bringing new ideas to the Valley's culinary scene." Located in the Shenandoah Valley in Virginia, Harrisonburg is a wonderful city with an abundance of memorable places to eat in. From establishments serving five-star cuisine to hip foodie joints, if you love a good culinary adventure, Harrisonburg will not disappoint. Here are the top places to eat in the area. 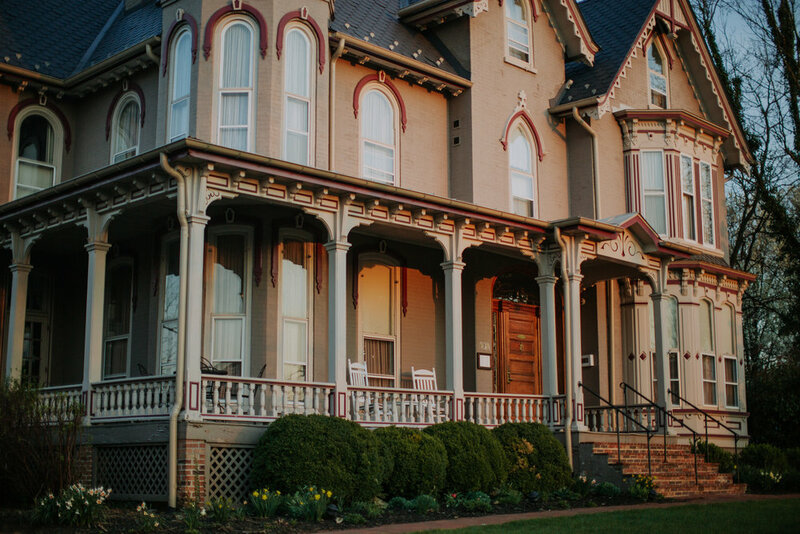 Located in an elegant Late Victorian house built in 1890, the grand Joshua Wilton Houserestaurant can be found right in the historic old town of downtown Harrisonburg, and is listed on the National Register of Historic Places. For those wishing to experience the refined tastes of Virginia, the creative menu will surely deliver. Early on a cool Saturday morning, the Harrisonburg Farmers Market is bustling. Local farmers happily peddle fresh herbs, sweet potatoes, asparagus and black walnuts as patrons browse homemade soaps, baked goods, honey and an array of plants ready for home gardeners to stick in the ground. Although the local vibe is rooted in events such as these, Harrisonburg’s homemade and homegrown movement has flourished to nearly every facet of this colorful and cordial college town in the heart of Virginia’s Shenandoah Valley. At a nearby stand, Brian Bogan, executive chef for the Joshua Wilton House, is preparing crostinis with asparagus, arugula and watercress pesto, topped with goat cheese and grated, cured egg yolk. He demonstrates to a group of fascinated onlookers how to prepare the dish, then offers samples and a recipe at the end. The Joshua Wilton House has been a staple in Harrisonburg for many years (it was the first house in Harrisonburg to have electricity, if that’s any indication). A classically-restored Victorian home-turned restaurant and inn, it’s a favorite place for visitors and locals alike. Their fabulous restaurant offers a seasonally-focused menu, with approximately 90 percent of their ingredients sourced in the Shenandoah Valley. The feel here is Southern with a French influence, which can be seen (and tasted) in menu items like their all-natural duck breast served over hickory-roasted delicata squash and red onion with French lentils and concord grape gastrique. The theme can also be found in their heavenly pastries from extraordinary Pastry Chef Elizabeth Stover, who refers to her baked goods as “edible love.” When you try one of her pastries, you’ll wholeheartedly agree. Stover shares the Joshua Wilton House vision of supporting local farms to offer the best ingredients, noting that it’s always important to be a good steward of the products that you serve. "Be thankful you don’t handle the books for this Victorian mansion-turned-B&B. “We work with over 60 local farmers,” says general manager Brad Reese. “It makes bookkeeping a nightmare, but it’s worth it.” The diverse, near-obsessive sourcing means only top-notch meat and produce hits your plate, including pork from Autumn Olive Farms and organic poultry from Polyface Farms. Run by chef Brian Bogan, the kitchen serves Southern classics with a French twist, such as duck breast served with lentils, country ham and a duck confit bon bon. Upstairs, you’ll find five inn rooms decorated with country chic details like floral wallpaper and carved wooden bed frames. Each has views of Harrisonburg, Va. — the city at the heart of the Shenandoah Valley and the home to James Madison University. Explore around the historic campus and you’ll find independently owned boutiques, cafes and breweries. More outdoorsy types can head to a handful of hiking trails (or the Appalachian Trail 18 miles away, if you’re feeling adventurous), ski slopes at the nearby Massanutten Resort or tours of local farms, where you might recognize some ingredients from Joshua Wilton’s menu." “Why wouldn’t you come to this?” one of my dining companions asked partially through our Flights and Bites meal at Brothers Craft Brewing on April 20th. It’s true. For $40 and two hours on a Wednesday night, we enjoyed six courses of beautifully crafted food carefully paired with beers from Brothers Craft Brewing. Chef Brian Bogan of the Joshua Wilton House and Chef Jakob Napotnik of the Local Chop and Grill House teamed up to create a menu that highlighted both local ingredients and local beer. Adam Shifflett, managing partner at Brothers and both chefs introduced each food and beer course while we lucky ones shared tables with strangers who quickly became friends. An incredible event by three true craftsmen of food and beer. If you ever find the opportunity to attend a pairing dinner by any of the chefs or breweries who call Downtown Harrisonburg home, you must go."